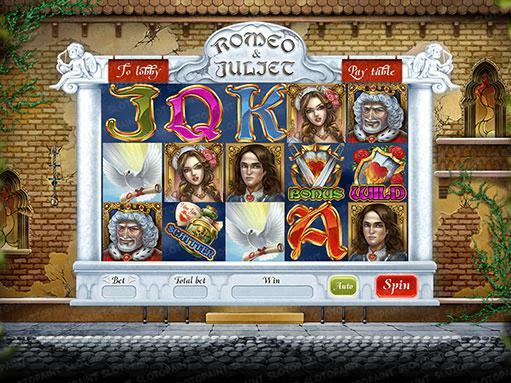 We present to your attention the main interface of the slot machine “Romeo & Juliet”. 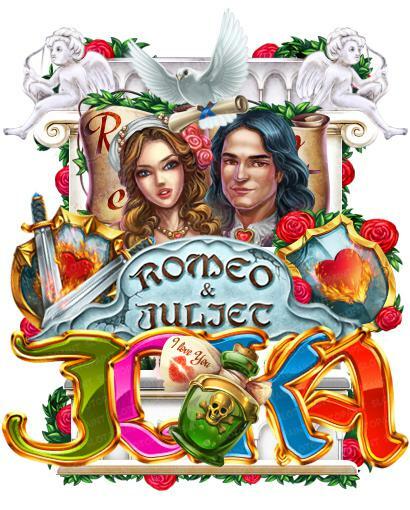 As the main theme of the slot machine, we were inspired by William Shakespeare’s play “Romeo and Juliet”. The game reels is a field of 5×3 cells, where all the game symbols involved in the game are conveniently located. Below is the control panel and navigation, where the player can not only press the desired buttons, but also track his game progress. For example, at the bottom panel there are special windows in which you can see an amount of your current bet and the number of points already won, as well as the level of your bet, which you can both raise and lower. The “paytable” button will open an additional window with rules and payments tables where you can get acquainted with the rules and winning numerical values for certain symbols, and the “to lobby” button will return you to the main game screen. This background image is the main one and conveys a sense of the old era, when in rich estates solemn dances and carnivals were held. In addition, this background image can be used as a pop-up screen and transition between the pop-up window and the basic game mode. The game interface is located in the central part of the background image and doesn’t overlap its remaining parts. Here you can see a set of game symbols that are divided into 3 categories. The lower part of the symbols is in the “low” category and brings a small number of winning points. The middle part is in the category “middle” and brings the usual number of winning points, and the top line belongs to the symbols from the category “high”. These symbols have unique properties for the player. For example, getting of the symbol “bonus” activates an opportunity to play the bonus game. The “scatter” symbol gives the player an additional number of free spins for the “free spins” mode, and the “wild” symbol substitutes any symbol during the game for the winning one, but only if one symbol is missing to get the winning combination. Here we decided to show animations of game symbols for all categories. 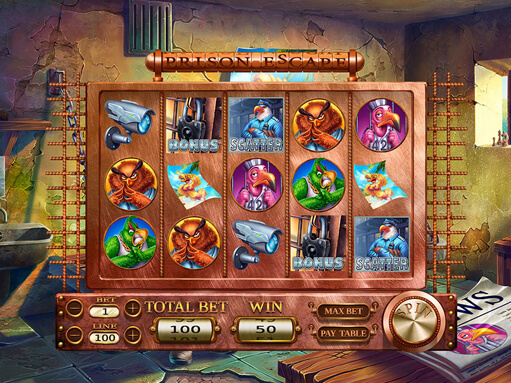 At the top line there are symbols from the category “high”, which have special properties and bring the player special bonuses, in addition to large winnings; the middle line belongs to the symbols from the category “middle” and brings the average number of winning points to the player. At the bottom line are symbols from the Low category, which are made in the form of capital letters of card suits and bring a small number of winning points to the player. This screen is an auxiliary table of rules and payments, where the player can get acquainted with all the numerical values that are awarded for simultaneous getting of certain symbols. The more symbols of a certain type you’ll obtain simultaneously at the game reels, the more winning points you get. Slightly below are the buttons, with the help of which you can scroll all the pages in any order, and also return to the main game screen. This screen is an auxiliary table of rules and here are brief classifications of game symbols from the category “high”. For example, the symbol “scatter” if been got, brings the player from 3 to 5 free spins and appears on 2nd,3rd and 4th reel. If you’ll get the symbol “wild” it’ll substitutes for any symbol on the game reels, including the symbol “scatter”. This screen is an auxiliary table of rules and payments, where the player can get acquainted with all the winning combinations represented in the form of colored lines.